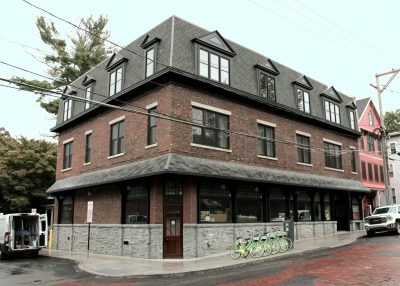 Collegetown is often referred to as Ithaca’s “second city,” and residents of the apartments in Collegetown are right in the heart of it. 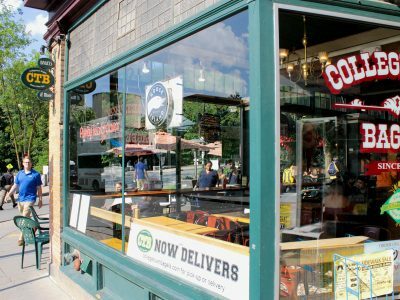 The Collegetown neighborhood grew up around Cornell University; with bars, restaurants, and busy sidewalks, Collegetown apartments can feel like they’re in a much larger city. If you’re an undergraduate at Cornell (or wish you were) this is the place to live. New Collegetown apartments at 404 Stewart Avenue. 404 Stewart Avenue is one of the newest and most modern apartment buildings in Collegetown. This building has 1-, 2-, and 3-bedroom apartments, all with newly-constructed kitchens and modern appliances. The living areas in these apartments get plenty of natural light. 404 Stewart Avenue is conveniently located near Cornell University’s campus and Collegetown bars and restaurants. Downtown Ithaca is only a short walk or drive from Stewart Avenue, through the East Hill Neighborhood. 116 Osmun Place – 6 units; (1) Studio, (4) 1BR, (1) 2BR. Off-street parking available. 408 Stewart Avenue – 6 units; (2) Studio, (2) 1BR, (1) 3BR. Off-street parking available. Collegetown is located at the top of East Hill, just south of the Cornell neighborhood and west of Belle Sherman. Collegetown sits above Route 79 to the south, just across from the Six Mile Creek neighborhood. The storefront window of the original Collegetown Bagels location. Collegetown shops and restaurants – Mostly concentrated along Dryden Road and College Avenue, Collegetown has about a dozen locally-owned bars and restaurants catering to the local college crowd. Cuisine styles range from Indian to Thai to Japanese to Mediterranean, alongside more traditional American fare. Locally-owned favorites include The Nines, which occupies a converted historic firehouse and serves the best deep-dish pizza in town. Shops include minimarts, grocery stores, and a liquor store, as well as an optician, a barbershop, and a shoe store. The Carriage House – A historic landmark, as well as one of the best restaurants in Ithaca, the Carriage House is a renovated farm building from the 1800s — carefully restored and converted to a cozy cafe, serving breakfast and lunch. After the downstairs restaurant closes for the evening, the upstairs loft opens as a sophisticated cocktail lounge with a great balcony. The Schwartz Center – The Schwartz Center is operated by the Cornell University Department of Performing & Media Arts, and offers student-led theatrical performances to the public throughout the year. Productions range from drama to musical theater to avant-garde; the Center also hosts several theatrical festivals. For fans of unusual architecture, the modernist building is one of the largest and most striking features of Collegetown.